Each year, Georgia Organics coordinates a state wide campaign to get kids across Georgia eating, growing, and learning about a new fruit or vegetable during October Farm to School Month. Download the 2018 Georgia Organics State Event Competitions Guidelines here. Promoting a well rounded campaign with various activities, taste tests, puppet shows, recipe development, and school garden activities. Using recipes utilizing legumes for high school culinary and nutrition classes at school. Integrating legumes in their school gardens. FCCLA helped make 2017's October Farm to School Month a HUGE success! 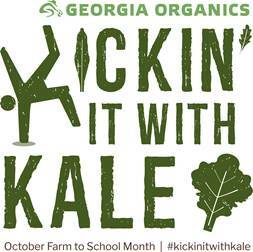 We hope Georgia FCCLA will be Kickin' It With Kale!